The Pertwee era’s answer to ‘The Daleks’ Master Plan’ continues with ‘Planet of the Daleks,’ picking up from the cliffhanger ending to the exciting events of the space opera ‘Frontier in Space’ but strangely doing little to acknowledge that preceding serial with no resolution to the human and Draconian conflict offered. Unfortunately, while ‘Frontier in Space’ was able to mask its padding with intriguing characters and setting changes, ‘Planet of the Daleks’ is unable to replicate that feat. The story also oddly treats the revelation of the Daleks’ presence as a surprise, a fine plot point by itself but completely unnecessary since the Daleks appeared at the end of the last story and the title rather blatantly gives their presence away from the outset. The planet Spiridon is a fascinating setting, its climate changing from extreme to another during the course of a day and containing hostile and merciless vegetation. However, these intriguing concepts are employed more as distractions from the light Dalek plot than as actual plot points in their own right. Interestingly, the Daleks seem to have become quite adept at invisibility in the opening episode, significantly increasing their seeming power and menace. It’s strange, then, that this is essentially dropped after the first episode except for a few casual lines spread throughout the narrative. Instead, the Daleks go through familiar tropes from their previous outings: forcing the local population into slavery, releasing a biological weapon, and even renewing their ages-old conflict with the Thals. This in itself is no significant issue, but there’s a lack of excitement or energy from either side as events unfold, never effectively creating the notion that this is a monumental conflict. Indeed, the Daleks here seem to be at their weakest after the invisibility guise is dropped, their enemies jumping onto them without second thought. There’s no indication that these are the most dangerous foes in the universe, and one’s cries for assistance as the Doctor shoves it into an ice volcano is actually quite sad. 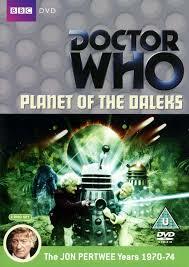 This shortcoming is especially significant because the dialogue used to describe the Daleks’ past actions is superb. Hearing of their mass exterminations and terrorizing suppression of the locals to gain control of the planet imbues them with the requisite menace while hearkening back to their early days, but it never comes across in the story at hand. Even the models and set shot used to portray the largest Dalek force ever assembled fails to capture the scope and ambition attempted. As an aside, the script seems to waver between recognizing the sentient mutants within the Dalek casings and treating the Daleks simply as robots, a slight inconsistency that is never really explained. ‘Planet of the Daleks’ has a lot of potential, but it never quite coheres into something that can make up for its individual components’ shortcomings. There’s an anti-war sentiment stuck onto the end, which seems a bit at odds with the cheerful celebrations following the Daleks’ defeat. Sadly, the Daleks are not used effectively in this tale aside from the opening episode, doing little to exert the menace they carry and eliciting little actual fear from those they confront. With little connection to ‘Frontier in Space’ that fed directly into this tale, ‘Planet of the Daleks’ is competent but ultimately a wasted opportunity on several levels that can’t finish off this intended epic strongly.